The Success Principles, how our subconscious minds do no argue with us, it simply accepts what our conscious mind gives it. Whatever we say with our conscious minds, our subconscious minds will work to make it so. Les Brown, motivational speaker once said “Don’t say I am broke. Say I am overcoming a cashflow problem!” This is a beautiful way of rephrasing a negative and limiting belief. Below are some of the biggest limiting financial beliefs that are keeping us from abundance in our financial lives. As well as positive beliefs to counteract and replace them with. How were limiting beliefs developed? Well unfortunately they usually stem from our childhood. Some parent or teacher told us we couldn’t do something yet and then did it for us. Instances like this built up feelings of incompetence. But it is never too late to identify these limiting beliefs and start to replace them. Just like how to stop a bad habit, we must replace it. The same is true with limiting beliefs. We can only rid ourselves of it by replacing it. Below are some of the ultimate limiting beliefs about various areas of life. And positive beliefs that you can replace them with when the come up in your mind. This is just a list of some of the most popular (or not popular) beliefs that we hold in our minds. But in order for you to get the most out of this post, allow yourself to engage in the following activity. 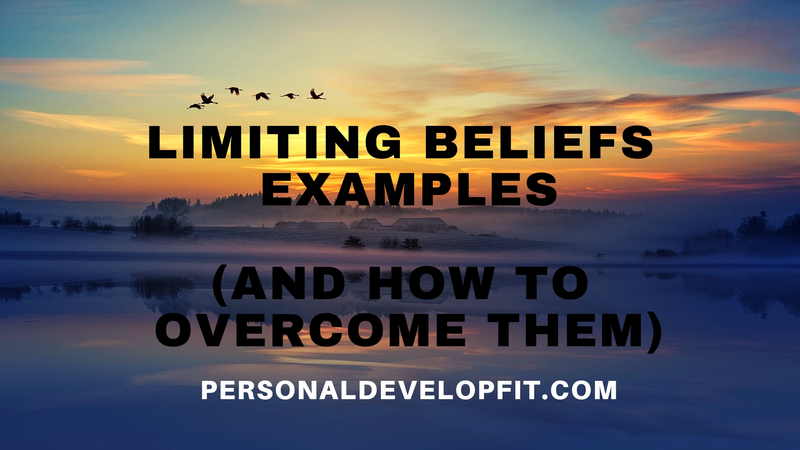 Identify many of your limiting beliefs that you want to change. Write them all out. You can get some help with this by getting together with some friends and doing this activity together. Where you guys develop a list of all the limiting beliefs that came from when you were all kids. Things that came from the parents, your teachers, religious leaders, sports coaches, TV shows, older or younger siblings, etc. Then look at how this belief is limiting you. Look at all the areas of life that it is getting in the way of living an abundant life. How it is holding you back. Then look at the positive things that can come out of creating a positive belief out of the negative one. Seeing the other side of the coin will allow you the motivation to change this limiting belief. Then for 30 days straight, repeat multiple repetitions per day of the positive belief after bring up the limiting thought and feeling. After a while, they will penetrate into the subconscious mind. Setting themselves in stone. This is when you sill start acting out the new and positive beliefs with ease. Below are 11 more tips that you can use to help you along the process of getting rid of negative thoughts and beliefs. A great article by Maqtoob.com talks the power of using visualization under states of deep relaxation. Essentially when we meditate, our brainwaves move from Beta brainwaves to Alpha brainwaves. Or even into the deepest state of relaxation known as Theta. The later two are the most suggestible states where it becomes much more simply and easy to reprogram our brains. Enforcing them in our subconscious minds. So if you are open to it, take time out of your day to meditate. Then once you have done so, refer to the list above and start visualizing thoughts that oppose your limiting beliefs. Replace them verbally and with new brain pictures. Before you meditate, give yourself a quick scan of your body. Relaxing areas that are tense. This will get you ready to enter into deep states of relaxation at a more rapid rate. Often times we will says things like “I am just big boned, that is why I am overweight.” Or “I have always been a drinker and always will be!”. Saying things like this is not only reinforcing the limiting belief and keeping us from what we want. But it is forcing the limiting belief deeper and deeper into our personality. Our personality is a reflection of what we believe ourselves to be. If you take on the personality that you are a workaholic, your daily actions will usually show this to be true. This is because when you describe yourself to people, you will usually say this. If you identify with being fit, your internal and external dialogue will reflect positive thoughts that keep you in the gym and eating healthy. But the same is true about limiting beliefs. Often we fight for their validity and truth. Someone may even tell us to stop believing that about ourselves. And we oppose them with reasons on why they our wrong and our self limiting belief is right. In order for you and I to stop reinforcing our negative beliefs, we need to surrender to them. Instead of fighting for them, either just stop doing so when they come up. Or better yet fight AGAINST them. You can do this by following some of the tips above. 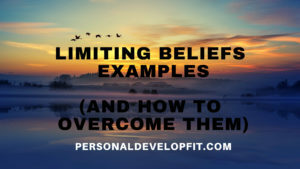 And of course referring to the big list above on examples limiting beliefs and their opposing positive beliefs. You can also ask yourself what is getting in the way of replacing this belief. Often times we are the only ones that can give the answers to this. And going within can help you identify what is really getting in your way of replacing the negative belief with a positive one. So when stating negative limiting beliefs, often times we use phrases such as “ought to”, “should” and “must”. When we do this we bring upon feelings of guilt. Like for example, saying things like I should be skinnier or I should be more disciplined. This is phrasing things in a way that are making you feel bad and guilty. When this happens it isn’t moving you in the right direction. Instead, use phrases such as “I want to fit” or “It is conducive to my goals to be fit”. Replace it with anything else. This will help you phrase your beliefs in a positive manner. And also frame your mind in the positive. Bringing you away from feeling guilt over not having your goal yet. He refers to automatic negative thoughts as ANT’s. And just like ants in your house, you want to and have to get them out. Stomp them out by not allowing them in your mind. Don’t believe them. It is just a thought. Just because your thinking it, doesn’t mean it is true. The first time I realized this, it was almost a miracle. I was so caught up in the programs and limiting beliefs in my mind. But when I realized just because they were coming into my awareness, doesn’t mean I have to believe them or act on them. Instead of identifying and believing them, simply ask yourself “why not”. So if you think you can’t go back to school, then ask yourself why not. Whatever comes up is again, just an excuse. You mind trying to keep you safe. But everything something comes up, see it as just an excuse and something that doesn’t need to stop you. Again guys, these are simply just limiting beliefs coming out of the file cabinet of your mind. Keep asking why not, and you will get to the root cause. As well as simply laugh at all the excuses that come up. The more we question our limiting beliefs, the more we expose them. They are no longer running us on autopilot. It is like a screaming kid. It simply wants attention. Just give it attention by examining them then letting them go. Literally see them as a three year old crying child. This will help you see how funny these little crying babies are. How we think dictates how we act. If we are a baseball player and we think we are a bad player, we will take the actions needed that reflect our inner beliefs. Have you ever seen someone do so good at a sport they have just tried? Or even a child who throws a strike on their first bowl? This is because they have accumulated any beliefs about it yet. They have not limiting beliefs about what they are doing that are manifesting themselves in the physical world yet. So when you are thinking a limiting belief, remind yourself that it is only your fault if you take the actions that support it. This can make you the captain of your life. Instead of believing them, replace them with the positive. Believe that and then you will physically act in accordance to your new belief. The more you oppose your negative beliefs with positive and infinite beliefs, the more they will become set in stone. It is like putting a post in slab on concrete. It may be wobbly at first, but as the concrete sets, the board becomes rigid and set in it’s ways. The same is true about our thoughts. It will set like concrete. As children our parents told us not to hang out with “those” kids. They were probably doing things that made them look cool and so naturally we wanted to hang with them too. So that we would become popular and look cool. But parents told us this for the simple fact that we become what we hang around. And although it felt like a punishment that we couldn’t go over to little Johnny or Susie’s house when we wanted, it was a blessing. But now that the parental’s aren’t around to tell us who to hang out with, we need watch who we are hanging with. If someone that you hanging out with has a limiting belief, which we all do to an extent, we will pick up on it. Even if at first you think how absurd it is. It will start sinking into our mind and setting like concrete after hearing it over and over again. The same is true with the posture of the people we hang out with. If the people around us are hunched over and self defeating in the way they hold themselves, we will become the same. And posture has a lot to do with our minds. The more upright and proud we stand, the more positive we become. So monitor the closest people around you. Notice if they are having any limiting beliefs come up when you are around them. And tell them to stop thinking and saying it. This will not only show them that you love them, but help them change their lives. But most importantly, you are prepping an environment for more nourishing and limitless beliefs and thoughts to grow and take root. No I am not talking about a health screening. I am talking about a reality screening. When it comes to our minds, it is simply a file cabinet in which we have stored information. But the heart gives us true answers. So next time you think a limiting belief, simply know it is just one of your file cabinets opening up. But then look to your heart for the real answer. Ask your heart what is really true. More often then not, you will get a more self empowering answer. What do parents do when they see their kid is suffering in math? They hire them a tutor. Instead of saying that their child is stupid, the just see it as something they need help with. So they become proactive. The same is true about our limiting beliefs. We need to be proactive at getting rid of them and replacing them. This means surveying the resources you need to use and the things you need to learn in order to replace them. So say one of your limiting beliefs is that you aren’t smart enough. Then first off you need to identify what that means to you. Not smart enough in regards to what subject or subjects. Then take the action needed to gain the knowledge in those subjects so that you can feel more smart. Also, recognize that everyone is inferior to each other in some way. And superior to others in other ways. That doesn’t mean that you are superior or inferior to these people. You are just inferior or superior in regards to certain things. Because of societies standards, a doctor may look more superior than a stay at home mother. But its true that the stay at home mother is way more competent in being a good stay at home mother than the doctor is. And vice versa. This may be in every single one of my articles. Simply because it is the tip that makes all other tips easier and more effective. When we keep growing as people, we take things less serious. We become more positive. And we believe in ourselves more. The things that used to bother us, no longer to or not as much. When we keep growing, we change our self image to reflect a more positive and loving image that we act from. Limiting beliefs often times disappear and we manifest more greatness and abundance in our lives because of it. Often times all we need to do is reflect on how negative beliefs are impacting our lives. Is it help us or hindering us? Also, take it one step further. Think about all the people in your life that it is affecting. Say we don’t think we deserve to be rich. Well this will get in the way of opportunities that can make you more wealthy. Which in turn can help you give your kids a better life instead of having them suffer. The most motivating things we have ever gotten in life usually come from us wanting them for someone else. Do the same with your limiting beliefs. Simply look at how it is affecting you and the people you love. This can give you enough willpower and courage to let go of your limiting belief. After you have seen how the limiting belief has been a catostroph in your life, now it is time to flip the deck. See how the new and empowering belief will benefit you. And the abundance and good feelings it will give you. This can give you the courage to let go of trying to defend your limiting beliefs and finally change it for good. So as you can see, even in the phrase, limiting beliefs are just beliefs. It is like believing in Santa as a kid. He was so real and true as a child to you. But as you learned the truth, you chose not to believe the lie anymore. You unlearn the false and adopt the truth. The same is true with limiting beliefs. They are just beliefs and can be changed by believing the opposite and empowering belief. I hope this article helped you. I would love to hear what you thought about it and also if you have anything to add that can be helpful to our community. As we can all learn from each other! Hope you are having a great day, week, month and year.